Australian nuclear scientists are helping an international team of archaeologists and historians to unravel a mystery about a collection of Egyptian mummies prone to cross dressing and lying about their gender and their age. 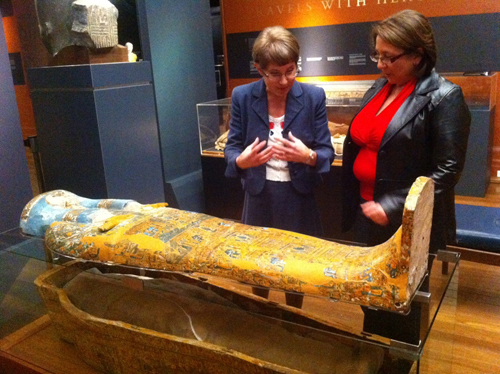 Honorary Associate at Macquarie University’s Department of Ancient History, Dr Karin Sowada, started investigations into origins of the mummies some years ago when she was an Assistant Curator at the University of Sydney’s Nicholson Museum that is home to the mummies. Perhaps most surprisingly, 2005 research (based on CT scans and other data) revealed mummy NM R27.3 was actually a man inside the coffin of a woman. It is this latter gender-bending mummy, NM R27.3, which is now subject of further study by archaeologists and scientists at the Australian Nuclear Science and Technology Organisation (ANSTO), who are using nuclear techniques to date the mummy. “In the 19th century it was common for Western tourists and scholars who journeyed to Egypt to bring home mummies, coffins, and other artefacts as souvenirs,” Dr Sowada said. “Those antiquities were usually acquired from local dealers, whose attempts to maximise profits sometimes extended to breaking up objects for separate sale and creating ensembles that did not historically belong together, such as putting an unrelated mummy into a coffin. “As the decades passed on, many of these antiquities transferred from private collections to museums – where we are now starting to discover they are not all what we first thought. “Through analysing coffin styles, embalming techniques and wrapping methods, and techniques like DNA sampling, CT scans and carbon dating, we are starting to understand the real origins of many artefacts. Research published in 2005 showed mummy NM R27.3 was actually a man not a woman, and nuclear science techniques are now helping piece together more of the puzzle. “We know the mummification technique was interesting – wrapping the body, coating it in a plaster shell, painting it red and green, then wrapping it again,” Dr Sowada said. “This mimicked royal mummification methods, but appears to have been undertaken with cheaper plaster. This plaster was painted red and green in imitation of the god Osiris. “These shells have been reported sporadically in the literature but are rarely seen by modern scientists. This could be an early example of this technique used by non-royal individuals. “We do not unwrap mummies anymore – the plaster shell was only revealed under the gaze of a CT scanner and confirmed when samples were extracted from the wrappings during analysis. “Together with the plaster samples and CT scans, the carbon dating will help us nail the date and build a story about the origins of this mummy. The Australian Nuclear Science and Technology Organisation (ANSTO) is custodian of the $460 million OPAL research reactor – one of the most advanced in the world. Its campus at Lucas Heights is also home to Australia’s most significant radiocarbon dating facilities. Radiocarbon dating is a process where the amount of Carbon-14 (C-14) in organic material is used as a measuring stick for its age. C-14 is in the atmosphere and becomes part of an organism as it grows. Once the organism dies the C-14 begins to decay away at a constant rate, so the older the material is the less C-14 it will have. By measuring the amount of C-14 left in a sample, and knowing the rate of decay, we can determine its age. “ANSTO scientists radiocarbon date objects as diverse as bones, textiles, pollen and shells,” said Dr Geraldine Jacobsen, ANSTO’s Task Leader, Accelerator Mass Spectrometry. “The radiocarbon dating we are doing now will help us get a lot closer to understanding when this person lived. “It is a team effort. We took samples of the fabric and extracted the carbon from the cellulose that make up the linen fibres. “This carbon was then converted to graphite so it could be measured using ANSTO’s two million volt tandem accelerator, STAR. More information: It is expected that the research will be submitted to Radiocarbon and peer reviewed, and pending that, published next year.